Discover the joy of these electric all-terrain transporters. They're fast, fun, highly maneuverable and a superb activity for a group party. Using easy steering techniques, you might head off and explore the woodland trails. You and your group will discover the joy of these electric all-terrain transporters. They're fast, fun, highly manoeuvrable and a superb activity for an unusual party. You will be amazed the way the segway balances itself perfectly to keep upright and in total control, meaning you won't be falling off all the time. Hopefully! Steering your segway is easy, you lean forward to go forward, lean back to stop and turn by using a 'lean steer' handlebar, leaning it left or right. 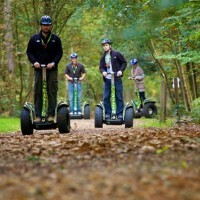 Once you have mastered how to operate your Segway (don’t worry, you’ll learn all you need to know) you will head off and explore the woodland trails.